When away on a skiing break, most winter sports enthusiasts are keen to hit the slopes as quickly as possible in the morning. For many self caterers, this means a hastily eaten piece of toast as they head out the door, or even a snack grabbed on the slopes mid-morning. A healthy, well-balanced breakfast, however, provides skiers with the slow release energy their bodies so vitally need to make it through to lunchtime. Importantly, well planned skiing breakfasts also include protein. This key nutrient is a skier’s best friend, helping to build and repair muscles. Here are a few examples of quick, delicious and nutritious breakfasts that can be prepared with ease by self catering skiers. 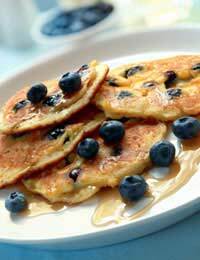 Blueberry pancakes are the ideal treat for a cold morning. Although tasty and filling, these pancakes are relatively light and low in fat, meaning that you can pick up your skis shortly after wolfing them down, knowing that you will be safe from the perils of indigestion. The ingredients are widely available and no specialist kitchen appliances are required, making these pancakes the perfect option for self caterers. Prepare the batter the night before to save time. To make ten pancakes, simply combine 200g self-raising flour, 1tbsp baking powder and a pinch of salt in a large bowl. Separately, beat together one egg with 300ml of milk. Next, form a well in the centre of the dry ingredients and add the milk and egg mixture. Beat, until you have a smooth batter. Stir through a knob of melted butter, along with 75g of blueberries. To cook your pancakes, heat a small knob of butter in a non-stick frying pan. Spoon four large dollops of batter into the pan to make four pancakes, each roughly six centimetres in diameter. Cook for around three minutes, then turn and cook for a further two. Keep your cooked pancakes warm under aluminium foil whilst cooking the others. Serve with more blueberries and plenty of golden syrup. Scatter with flaked almonds for a healthy protein fix. Alternatively, serve with peanut or cashew butter. A speedy, simple, no-nonsense breakfast, a lightly fried egg served on wholemeal toast will provide you with the perfect balance of protein, slow release carbohydrates, fibre and iron. Add a dash of olive oil to a non-stick frying pan and heat for a moment. Add a cracked egg and pop a thick piece of wholemeal bread in the toaster or under the grill. Cook your egg gently, for around three minutes, so that it retains its flavour and softness. Butter your toast generously and scatter it with a handful of spinach leaves; there is no need to wilt them. Top with your fried egg and a scraping of wholemeal mustard. Those looking to fix breakfast in seconds need not forego their trusty breakfast cereal or granola. To ensure that the contents of your bowl help you go the distance, however, be sure to add fruit, nuts and seeds. Chopped apple, strawberries and other berries all work well. Flaked almonds, hazelnuts, sunflower seeds and pumpkin seeds are also great protein-rich additions to your morning. Opt for whole milk. The added calories will keep you going on the slopes. An active holiday need not signal the abandonment of the pleasures of food; far from it. Indeed, in experimenting with quick, tasty and healthy breakfast alternatives, you are sure to find something that surprises and delights your taste buds. When skiing, plan delicious breakfasts and you are sure to jump out of bed as soon as your alarm sounds, making it to the slopes on time, satisfied and prepared.